Despite their humble origins as pests, domestic mice (Mus musculus domesticus) have maintained treasured pet status for centuries around the world. First mentioned in Chinese texts in 1100 B.C., domesticated mice are inquisitive, food driven and easily trained once they come to trust their human. Your mouse will likely enjoy the challenge of speeding through a complicated maze to capture a reward if you follow a few basic steps that set him up for success. Domestic mice are descendants of the common house mouse (Mus musculus) and have an average lifespan of two to three years. Most active from twilight through dawn, adults range from 3 to 4 inches in length with soft fur in many possible color patterns, including albino with red eyes and numerous variations of brown, black and white. As social creatures, they do best when rooming with two or three fellow mice they’ve grown up with. Females get along best, but males can learn to share their space if raised together from infancy. Unfamiliar adult males will fight with one another. Mice breed easily and quickly, however, so keep your mouse population under control by never housing females and males together. If your mice are not used to being handled, allowing them time to get used to you will help reduce the fear caused by an unfamiliar activity such as maze running. Fearful mice are more interested in hiding than learning how to navigate a puzzle. Introduce yourself slowly by offering a tasty treat from your palm. Rest your hand in the cage and let them come to you to investigate. Do this two to three times a day after dusk when they’re awake and foraging. Once they’ve come to trust you as the bearer of delicious snacks, you can proceed with the taming process by picking up an individual and handling him away from the cage. 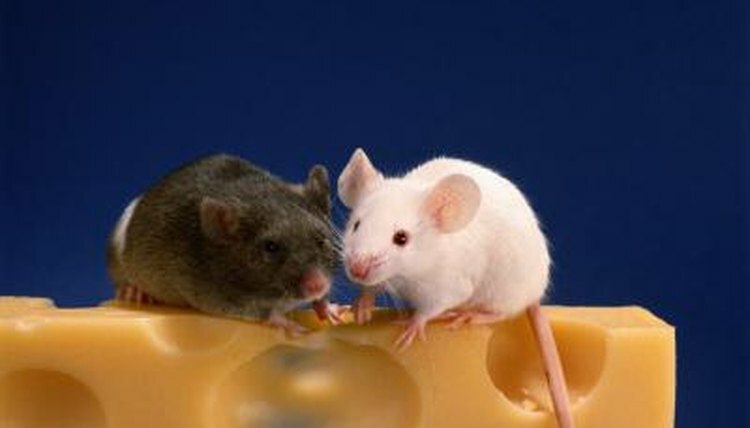 Always work with your mice in a place free of other pets or potentially harmful situations. You can purchase a maze or build one yourself from cardboard or foam board. Keep it simple at first to prevent your mouse from getting frustrated. Adding twists and turns to the maze as he learns will keep him interested. Start by laying a trail of treats from start to finish through the maze to help him get the idea. His wild kin may be used to running through tunnels to get to a food source, but your mouse likely finds his supper in the same corner of his cage every evening. As he progresses, spread the treats farther apart until the only reward awaits him at the end of his puzzle. Be sure you reduce his normal food portions to account for the treats he’s getting during training to prevent him from getting excess calories. Agility courses may seem more dog-friendly than mouse-appropriate, but your mice may enjoy a run through toilet roll tunnels and around mouse-size weave poles made from empty thread spools. Clear plastic tunnel segments that lock together, usually intended for hamsters or gerbils, let you change the maze course with a few simple clicks. Sturdy, mouse-size ramps and bridges can add a second level to his maze-running skills. Once each of your mice has mastered an individual run, they may enjoy pitting their skills against one another in a timed event. How Do Mice Protect Themselves?